The Ballon D'Or is cool I suppose, European Footballer Of The Year is somewhat interesting, but when will the powers that be finally pull their thumbs out and appreciate the people who really matter in football? I propose that a 'Happiest Player Award' is devised and implemented into Football. Clearly Lukas Podolski would be inaugural winner and would I be pushing it if I suggested that they name the trophy after him? Just a suggestion. A happy Lukas Podolski is a happy Arsenal, so Carl Jenkinson needs to crack a smile and relax or the whole thing is going to come crashing down and it'll be all Carl's fault. I remember a few games ago when Podo had just returned form injury and was sitting on the bench; Jenkinson, Fabianski and another fella who I can't remember were sitting on the front row, with the funny German throwing little balls of chewing gum wrapper at their heads, then when they turned around he would have a stone cold serious look on his face and play it off cool like nothing happened. Now, if you can't have a laugh at silly, childish things like that then what do you become? Chelsea, that's who. When was the last time you say Ivanovic smile? I don't think Ashley Cole's got much to laugh about either. You certainly don't see any such shenanigans going on at Shite Hart Lane, do you? And that is why our cohesiveness translates to the pitch. Shenanigans. I promote them. 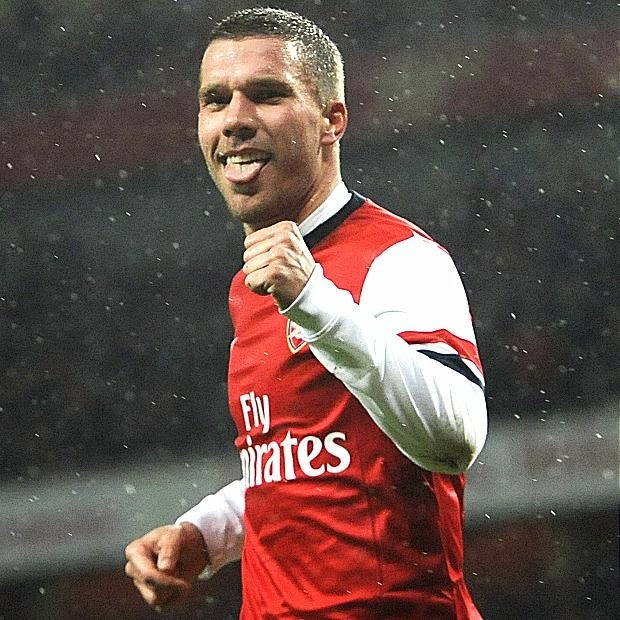 Podolski is a strange one though, as he never seems to cement himself as a starter. In the 2012/13 season I believe he was the most substituted player that year. I only recall him playing a full 90 minutes a hand full of times. What this means is anyones guess, but with a player of his quality you've got to wonder why he isn't one of the first names of the team sheet. Wenger has commented both this year and last about how he has the potential and needs to work hard to show it. You can extract anything from a classic Wenger quote, as they're more cryptic than an Indiana Jones treasure map, but I do wonder if he is referencing Podo's fitness and effort. I don't want to compare the two too heavily as it would be unfair on the German, but sometimes you see Podolski doing a bit of an "Arshavin" and he disappears from sight for a few moments. Presumably catching his breath or something, but it makes you wonder about his fitness. Andre Arshavin was famous for his poor physical fitness, and I do wonder if we have a slightly less drastic case of the same in Podo Baggins? If you watch the German hobbit off the ball it's amazing how he leisurely strolls into exactly the right position, recieves the ball and casually (yet emphatically) hammers it into the net. He's clinical in front of goal, so if we have to sacrifice a bit of fitness for sublime finishing then I suppose it's fair. Plus, nobody likes working out and running (at least I don't, so that means everybody), so all that excercise could lead to him being less happy. A less happy Podolski would mean a less cohesive Arsenal team and an even un happier Carl Jenkinson... I don't even want to begin to think about it. Let's just keep Podo happy, I think that's best for everyone. On a side note, I thought it was pure class from both sets of fans last night when Coventry displayed their "Why?" and "When?" signs. If you're not familiar this is referencing their situation of playing all their home games 35 miles away from Coventry at Sixfields Stadium in Northampton. It's all down to rent/money issues at their original Ricoh Stadium, and it's all rather sad really. Your teams' stadium is just as important as the team itself in my opinion, I mean, can you imagine playing our home games at Villa Park? I know we, as fans usually want the FA to bugger off and keep their nose out of things, but when it comes to situations like this I feel there should be more involvement from the Football Association. Same goes for the Cardiff owner changing their home colours, from blue to red. Now, I love the colour red, but if the opposite happened and Mr Stan Kroenke changed our colours to blue I'd be devastated beyond comprehension. History is part of football, and nobody, especially not rich owners, uneducated to the history of the team they just purchased with their oil money, should be allowed to mess with it. We, as Arsenal Football Club fans are very lucky that our team is run as well as it is, and that the clubs' legacy is preserved. Yet another reason why being a Gooner is the life to live. Sometimes we can lose sight of how well our club is run when we see the "8 years without a trophy" hung above our heads, but we can't lost sight of how consistent this club is. We will return to greatness, we've always been right there, it's just a matter of time. Oooh to be a Gooner!